The gap between rich and poor is huge and growing…legislative stalemate paralyzes the country…corporations fight federal regulations…the influence of money in politics is greater than ever…new inventions speed the pace of daily life. Sound familiar? 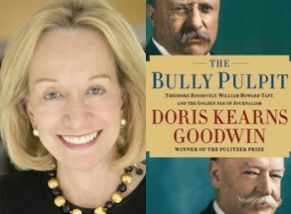 Those headlines from the early 1900s set the scene for Doris Kearns Goodwin’s new book The Bully Pulpit-a history of the first decade of the Progressive era – a time when courageous journalists and an ambitious president took on the Robber Barons – the 1% of their day – and won. Goodwin tells the tale through the long friendship of Theodore Roosevelt and William Howard Taft – a relationship that serves both until it ruptures in 1912, when they engage in a brutal fight for the presidential nomination that cripples the progressive wing of the Republican Party and helps elect Woodrow Wilson. Getting equal billing in her account is the golden age of journalism led by the muckraking press at McClure’s magazine. Together a bold and progressive press and a strong and progressive president served the people of the US rather than the super wealthy and the corporations. What lessons can we learn to help us turn this country around a century later? Next Next post: Free Forum Q&A: JARON LANIER, Author of WHO OWNS THE FUTURE?